The Minister has insisted that he only became aware of the final figures last November, despite documents showing that he was repeatedly warned as early as 2017 of steep increases in the cost of the project. In September 2017, Department of Health officials wrote of a 61 euro million increase in costs, which continued to ramp up until August 2018, when Harris was told of the potential new bill of almost 400 million euro in additional costs. The parliamentary Public Accounts Committee last week heard the total cost of the project, originally put at under 1 billion euro, is now unlikely to come in at under 2 billion euro. Officials at the Department of Public Expenditure have complained that they were kept in the dark as to how the costs was rising until November last year. Harris has claimed he “behaved entirely appropriately”. He said there was a “high degree of uncertainty” and “volatility” surrounding the figures, saying that he wanted to “get to the bottom” of the situation before informing anyone. The scandal comes as thousands of people today [Saturday] attended a rally in Dublin city centre in support of the campaign or nurses and midwives for pay improvements. More than 37,000 in the 26 Counties are involved in strike action in a dispute over pay and staff shortages, and are set to take action for three days next week. The relatively minor pay demands of the nurses and midwives, which the government has insisted cannot be afforded, have contrasted sharply with the out-of-control expenditure by the Department of Health under the current Minister. Despite being in a position to remove him, Fianna Fáil have said they are unwilling to take action against Harris. They have said they will continue to prop up the Fine Gael minority government regardless of any scandal, because of Brexit. Sinn Féin have said Mr Harris should now be removed from his role. Health spokesperson Louise O’Reilly has said that the Minister’s position is untenable and that the Taoiseach, Leo Varadkar, must act. “Minster Harris’ story is unravelling before our very eyes,” she said. In response, Martin said that Harris should “apologise to the Dáil” for the false statements. He said it was “extraordinary” that the minister would not have told anybody about the overspend until November. Sinn Féin leader Mary Lou McDonald has now written to Fianna Fáil in relation to the controversy surrounding the cost. 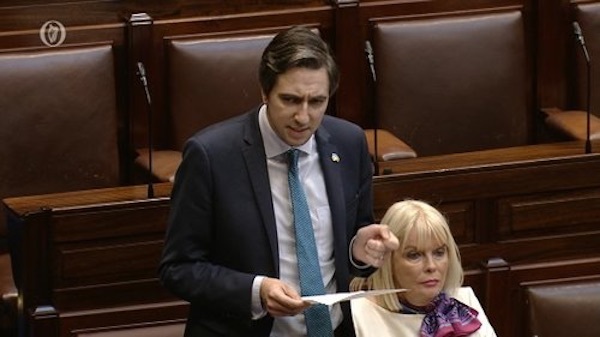 In a letter to Micheal Martin, Ms McDonald said the position of Health Minister Simon Harris is “untenable”. She said Brexit should not be used as a “catch-all” excuse to “tolerate and enable bad government”. “I invite you to make clear whether you have confidence in Minister Simon Harris and whether you will move or a support a confidence in the Minister for Health,” she wrote.